We’ve spoken with a lot of small businesses over the past 11 years, and one of the biggest easy wins is teaching customers how to create barcodes. Most of our customers haven’t made barcodes themselves, but they have seen them in retail stores. They take an item off the shelf, bring it up to the counter, the clerk scans it in — beep! — and the computer screen is instantly populated with the name and price of that item. This common experience can cause the misconception that the barcode itself actually had all of that information embedded within it. However, 1D barcodes (a.k.a. one-dimensional or linear barcodes) are really just a series of vertical lines in varying widths. These barcodes, which are common at most retailers around Europe and North America, don’t actually store a lot of information about products. When a barcode is scanned, the string of vertical lines are interpreted by the computer and then output as text. The point-of-sale system can recognize that string of text and will know to bring up certain details — like the name and price of that item — as a result. That relationship between the barcode and that item had to be established beforehand. The barcodes were generated either by the business itself, or in concert with an organization known as GS1, which licenses barcodes to companies all around the world. The types of barcodes you’ll see aren’t all the same; different barcodes will use different symbology. That symbology will determine the number of characters it can include, and what specific set of characters it can display. Codes like UPC-A or (12 digits) EAN-13 (13 digits) are often used in retail, and you’ll often see Code 128 (which can display all 128 ASCII characters) represent the tracking codes on packages. Making and printing your own barcodes isn’t that hard to do. You’ll use software on a computer to generate codes using an existing symbology like UPC-A or Code 39. First you’ll need barcode generation software, which can generate barcodes and also print them out for you. Or you can use a barcode font, like our handy dandy Archon Code 39 font, so that you can write your own barcodes in a program like Microsoft Word. It’s up to you how to break down the actual barcodes, but you’ll probably want to build in a hierarchy so that you can see, at a glance, what kind of product a barcode is for. 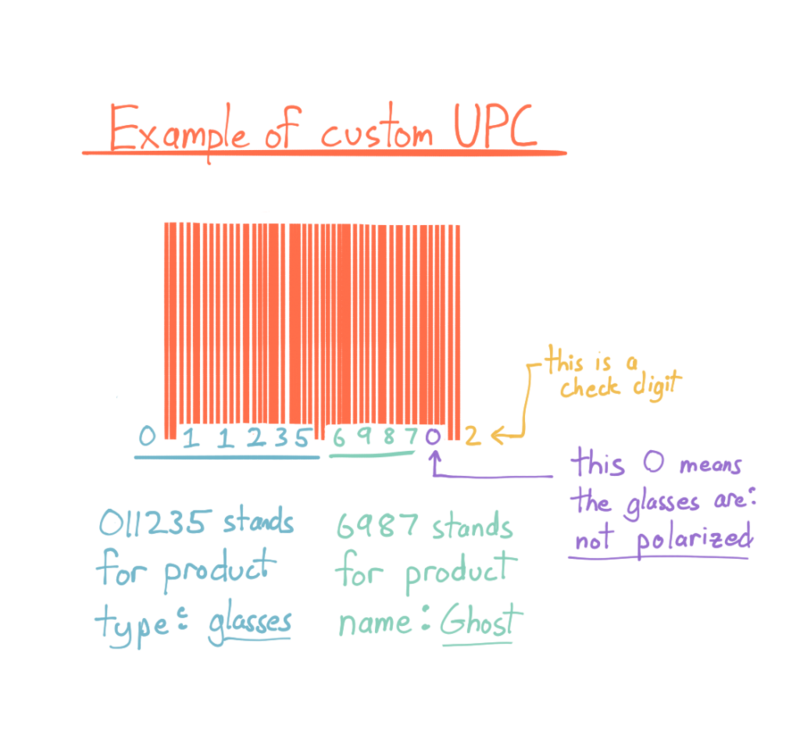 The UPC-A symbology gives you 12 total digits, but only the first 11 digits contain message data. 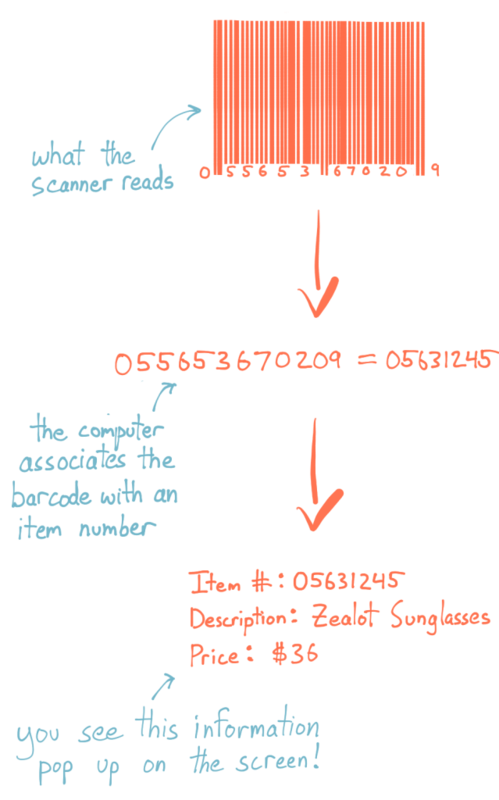 The 12th digit is called the “check digit” and functions as a way to verify the barcode has been read properly. If you’re generating your own codes manually, you can create a check digit with a bit of math. Once you have generated your actual barcodes in a program, you’ll want to print them out with a label printer so that you can physically attach them to your products. We’ve had success with the DYMO LabelWriter 450, but there are many other choices out there. You’ll also want to choose a barcode scanner. We’re biased here because we love the colors on our USB Scanners at the inFlow Shop, but there are a lot of good choices out there for under $100. Once you’ve generated barcodes and actually stuck them on products, you’ll want to tie those barcodes to product names in the inventory or point-of-sale system you’re using. Inventory software like inFlow Inventory will have specific fields for you to scan barcodes in; once the barcodes are associated with a product, you can then scan them in any time you’d otherwise have to type a name or item number into the computer. This can be accomplished for a few hundred dollars, depending on the software and hardware you end up choosing. The key thing to remember here is that the equipment will be yours, and the barcodes that you create won’t have any extra fees associated with them. If your long-term plan is to sell your own products in other stores (which use different point-of-sale systems), then you’ll want to make sure your barcodes are created and registered with GS1. This won’t take as much personal know-how and software, but it is a greater financial investment. Let’s take a look at the Universal Price Code (UPC) once more. As we talked about earlier, a standard UPC-A barcode has 12 digits in total. When you register a barcode with GS1, there are different tiers you can purchase based on the prefix size. These tiers have differing company prefix lengths — longer prefixes are cheaper, and smaller prefixes are more expensive. For example, registering a 9-digit company prefix with GS1 costs $750 for a maximum 100 unique items (as of 2016), and there’s also the $150 annual renewal fee to consider. 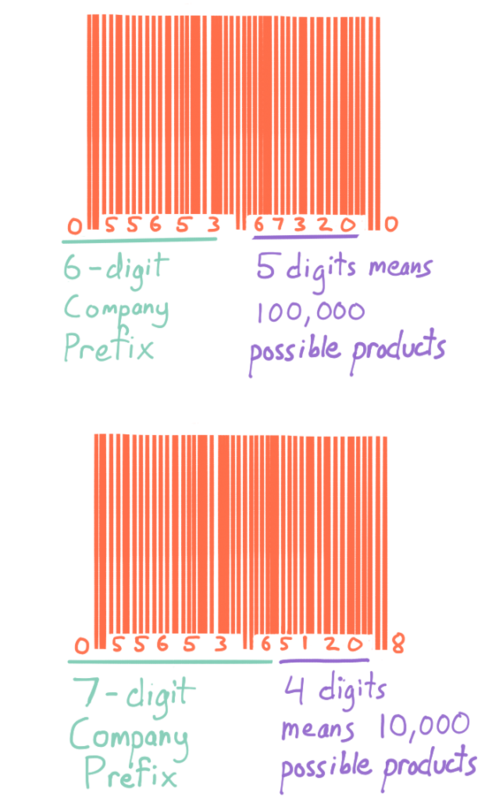 The fewer barcode digits used for a company prefix, the more products you’re allowed to register under that UPC. With officially registered barcodes, you will still have to generate the barcodes yourself, but you have fewer actual digits to play with. Once you’ve registered a prefix with GS1, you’ll have access to the GS1 US Data Hub | Product (yes, the name is a mouthful). That online tool will help you to generate and track all of the barcodes in your business. The barcodes you create with that tool will all be registered, which makes them eligible to be used at other businesses. As for printing: you can export the barcodes from the Data Hub for printing labels out yourself, or you can send the image files to a registered GS1 service provider. They can help you design and print the barcodes for use on packaging or boxes, if you’d like something more than just a simple label. The choice between having your own custom barcodes vs. registered barcodes really boils down to this: would you like to sell your product at stores other than your own? Creating your own custom codes can be done with your home computer, some software or font packs, a scanner, and a label printer. Once you have the right setup, the costs are about the same whether you choose to create 100 barcodes or 1000 (you’re just paying for paper and your time at that point). This can be a great choice if you’ve got a smaller shop, or if you just need barcodes to help manage inventory. But if you want to enable other businesses (especially larger big box stores) to stock your product, you’ll need to go the registered route with GS1. That means you’ll have to pay GS1 for the registration and annual renewal fees, and it can be costly to purchase shorter prefixes that allow you more barcodes. You’ll still have to make the actual business connections yourself in order to sell your products at other stores, but at least you’ll have the logistic work in place when you have registered codes. The links in this article point at US-specific resources, but you’ll be glad to hear there are GS1 offices all over the world. So if you’re looking to start barcoding your business and prepare for growth, your local GS1 office is a great place to start. After speaking with hundreds of customers about barcoding, we’ve realized that one of the most valuable things we can show customers is how to create barcodes. That’s why we’ve built that feature right into inFlow Cloud for Windows. You can choose between filling in the barcode fields yourself, or having inFlow Cloud automatically generate unique barcodes for each of your products. But that’s not all — we also integrate with DYMO printers so you can quickly create physical labels to scan. If you’ve been looking to create barcodes, inFlow has you covered. Can the barcode include letters? Our SKU numbers are something like EC281. Or is a better to associate a diget only code that would specify the SKU number. Hi Cal, your barcode can include letters if you use something like our Archon Code39 barcode: https://www.inflowinventory.com/blog/code-39-font-archon-free-barcode/. The choice of including letters or numbers is really up to your particular business, as the letters and numbers are all the same to the scanner (it reads them as a total number of characters). Hi I have a question. If I am selling the consignment products from other store, can I put my own 12digits barcode on the product beside UPC also? Hi Annie, if the product is from another store then it’s probably best to consult directly with them, since items on consignment are still technically their product. I can see why you’d want to add your own barcode to it for inventory tracking purposes, but in this case I’m afraid there is no general answer, and talking directly with your consignment partner is the best way forward. I run a small online antiquarian book store. I want a bar code system for internal use only to keep track of sold and unsold titles. There are almost no multiples so I’d need circa 3500 individual barcodes. My sales orders arrive through Amazon and two other bookselling sites and my inventory is held in a tab-delineated database. How would this work with Inflow? 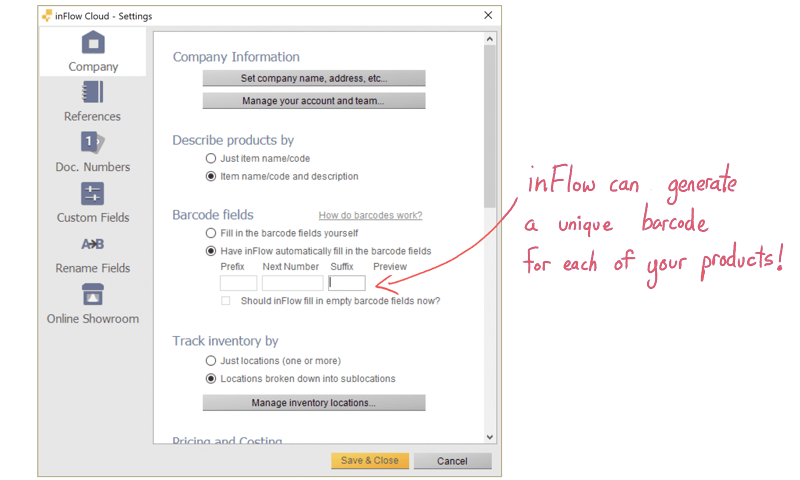 If you just need your own barcodes for internal use, then you could generate them with Excel and make sure they’re in the spreadsheet before importing your product list into inFlow. Once inFlow has the barcodes it’s as simple as scanning the barcode on the sales order screen, and the book will appear on the order. We are a small business that is trying to sell products through a retail store. Would the retail store POS be able to read our internally generated barcodes or do we have to get a UPC generated barcode? When selling your own wares elsewhere, you’ll generally want to have a GS1 registered barcode. That ensures that your barcodes won’t clash with any existing ones in the retailer’s system (since GS1’s registration would not allow duplicates). Good info. I have a question about supermarket barcodes. How are they created? There are multiple items on it and if we did a refund, they scan it and they can see the list of items in it and not just for one item. How did they create that? This is an educated guess, but if you’re talking about a receipt that has a barcode on it, that barcode probably represents the receipt number. Scanning it with their inventory system would then bring up that receipt in their database, which would have all of the items. Or if you’re talking about the supermarket scanning just ONE item and seeing a list of other items you bought, then that item might have a unique serial or lot number on it. They could use that to bring up the date/time you bought that item, and possibly show any other items you bought on that same transaction. Thank you for the succinctly written informative article on how to create bar codes. I have a query which i hope you will be able to resolve. I have a data base of Customer account numbers. For bar code purposes my sequence will include few digits in addition to the Customer account numbers to identify product scheme, brand etc. How do i go about getting my bar code data to correspond one to one with the existing Customer account numbers so that on scanning the bar codes, I will be able to get the associated Customer account number.